Weather Peacock Bass Association with fishing trips to the Amazon for peacock bass anglers. 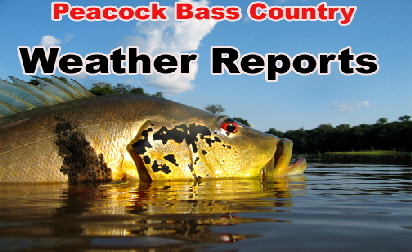 Today's weather hour-by-hour and 10-day forecast for towns and cities in Peacock Bass Country. Plan for an upcoming trip to one of the popular peacock bass fishing areas around the world. All rights reserved © 2001-2017 Larry Larsen. No part of this website may be reproduced or transmitted in any form or by any means without permission in writing from the association. Factual information, names, addresses and telephone numbers are subject to change and often do. We have tried to bring you the most updated information available. The Peacock Bass Association is not liable for problems associated with the reliability of information provided on our website or printed materials.